A US-based band is recording an album of material they wrote, but wants one of the tracks to be a cover of The Rolling Stones’ song “Brown Sugar”, written by Mick Jagger and Keith Richards. The band sells all 500 vinyl copies of the album plus 500 downloads on iTunes to US customers. According to the current statutory rates, how much does this 4 minute, 30 second-long cover of “Brown Sugar” generate in mechanical royalties, based on these sales? About a month ago, FMC launched a set of online quizzes. 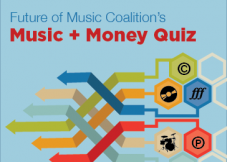 Ranging from “easy” to “expert”, these multiple choice quizzes were designed as a fun way to test musicians’ knowledge of common uses of copyrights and sound recordings, and to give us – as advocates and educators – a way to identify concepts and realities that are the most confusing.